Game Information: Guns n’ Roses was a legendary rock n roll band from the eighties who have recently reformed and quite fittingly, NetEnt released their exciting tribute pokie to this great band in January 2016. Perhaps it was the sheer quality of this 5 reel and 20 pay line pokie that inspired the band to reform? We’ll never know! This amazing video pokie is loaded with great graphics, an incredible soundtrack and exciting and fun bonus games and features, enough to make anyone feel like a rock and roll star! 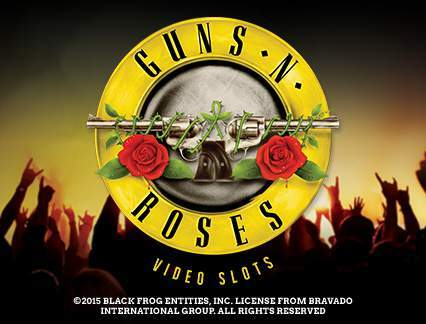 Let’s go backstage and check out what NetEnt’s Guns N’ Roses pokie has to offer! Guns N’ Roses has a lot to offer including great bonus rounds and features and flexible betting options, making it ideal for all types of bankroll players. The game may be bursting with special features and cutting edge graphics and sounds but remains quite easy to follow, making it also perfect for new players too. Expanding wild symbols (all wilds are expanding in this game). The Guns N’ Roses logo is the wild and substitutes any other symbol other than the Bonus Symbol. Expanding wilds cover the entire reel. The games bonus symbol is the LP Record and getting three bonus symbols on reels 1, 3 and 5 will trigger the appearance of the Bonus Wheel. Band member symbols are worth money and include Axel Rose, Duff McKagan and Slash. Level three: Another 8 picks, players must pick 3 and achieve 800 coins upon which their winnings will be doubled and can also trigger the Encore Free Spins Bonus game. The Encore Free Spins bonus game will give you 10 free spins which cannot be retriggered. However, the cool feature here is that one of the band member icons makes an appearance as a stacked wild on either reel 2, reel 3 or reel 4. The band member symbol is also a wild symbol on any of the remaining reels. The Coin Win Special Feature is pretty cool and will automatically award lucky players with additional coins from a minimum of 200 coins up to a maximum of 600 coins. The Legend Free Spins feature is randomly activated and offer 3 free spins with additional cool features. The first free spin adds a stacked wild while the second and third free spins add an additional stacked wild on different reels. The Appetite for Destruction Wild is also randomly triggered and appears in the shape of a cross that can turn as many as 5 different symbols wild (other than the game bonus symbol). The graphics includes plenty of iconic band memorabilia along with live video clips of their hit songs and animated band members who move around when you score a winning combination! The reels are set within a crowded live arena and you will hear the crown cheer every time you put a winning combination together. 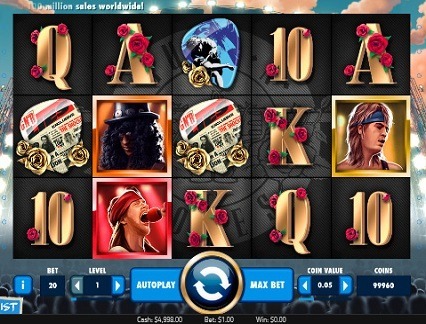 While Guns N’ Roses is not a progressive jackpot game it does offer a substantial payday. Getting five Axel Rose symbols on a payline will give you the game’s biggest jackpot of 75000 coins, provided you bet the max coin sixe and max bet and also have the 10x multiplier working for you. As you can see, the 10x multiplier makes all the difference as the regular game jackpot will be 7500 coins, also on max coin size and max bet.